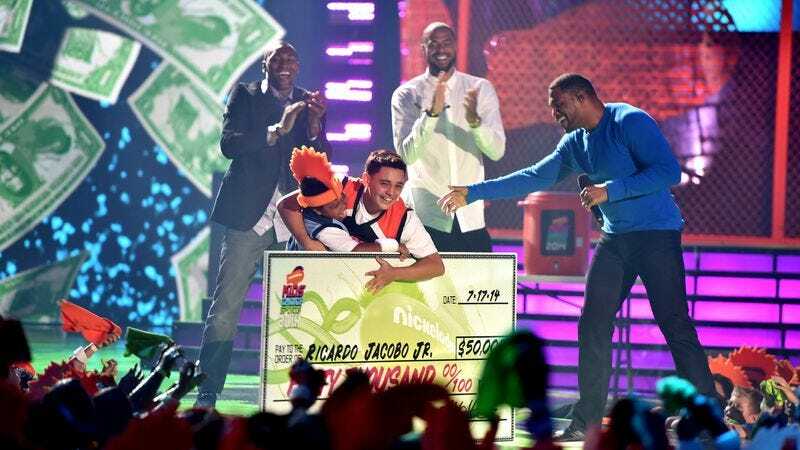 A winner celebrates nailing a half-court shot at the 2014 Nickelodeon Kids' Choice Sports Awards. When a car dealer offers a free Camaro to the local fan who kicks a 35-yard field goal at a college football game, it takes out a short-term insurance policy to cover its potential losses. Hamman’s company, SCA Promotions, is one of those unofficial insurers, weighing the chance the unlikely will happen and charging a fee to reimburse Tri-County Chevrolet if it does. Companies such as SCA are like auto insurers that collect premiums against the chance a safe driver will have a costly collision, except there’s no tragedy and the potential payoffs are enormous: $1 billion for a perfect March Madness bracket, $1 million to a fan if a skater scores five goals in an NHL game, $100,000 to a customer who makes a well-timed bank deposit. The piece is also full of interesting infographics tracking the odds Hamman uses to weigh out his investments. That perfect NCAA bracket Yahoo teases you with every year, for instance? One person in every 410 million will nail that, assuming they’re picking their favorites. If a computer randomly picks each game’s winner, then the odds go up to one in 9.2 quintillion. Interestingly enough, Hamman’s sports wagering is really just his side job. His real passion is bridge, and he’s one of the best competitors in the game, having won more than a dozen world championships. His company may post about $25 million in annual revenue, but for Hamman, that’s chump change.